A lot of sportsbooks try to get by on gimmicks. Offer a bunch of money up front and hope that sports bettors salivate at the dangling cookie which turns out to be just crumbs. Since 1998, Pinnacle has shunned this methodology in favor of offering sports betting fans exactly what they want: lower odds. For the most part, they deliver. But there are definitely a few things you should keep in mind, so read on for all the details. When you bet online, you want the best odds. Pinnacle Sports delivers in a big way. They offer some of the best odds online, with margins as tiny as just 2%, which is almost unheard of in the sports world. This isn’t across the board, so you’ll need to shop around, but a lot of the lines are just plain better at Pinnacle. 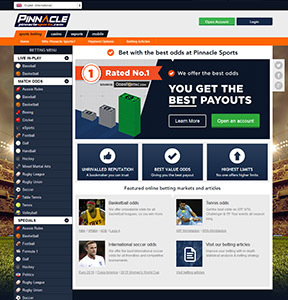 We also love Pinnacle’s commitment to helping bettors become more well rounded. Their eSports hub provides bettors with articles, betting help, and all kinds of information sports fans crave. You don’t even need to be a Pinnacle member to access this information, which says a lot about their passion for sports as opposed to passion for making a quick buck. We really like Pinnacle’s sportsbook, but their casino leaves a lot to be desired. While they do offer a live casino with attractive dealers, their regular casino lacks the variety that you’d find at other casinos, and at other sportsbooks with casinos attached to them. We’re also not a huge fan of their ongoing promos. While the sportsbook does offer that lower margin on bets, the truth is if you shop around you might find similar odds elsewhere, plus other sites offer you a bonus on top. But if shopping around isn’t your think and you want to know that you’re getting all around solid lines, Pinnacle is a good choice.